After BSSM S, which highlights Chibi-Usa's friendship with Tomoe Hotaru, there came BSSM SuperS which also focused on Chibi-Usa... in almost every episode. Thinking one couldn't possibly tire of this pink-haired loud-mouthed girl, here is an enitre movie dedicated to her. The story is weak compared to its two predecessors. The idea of fairies that kidnap children seems pretty contrived... in regards to forcing a plot that will center around Chibi-Usa. It introduces characters such as Peruru and Badiyanu who are hollow in character and mere plot-triggers. The art quality is superb. As the third movie with a large budget, animators can afford to try new and more complicated angles, which may bother some people as the shots can be considered a little too ambitious. The soundtrack is lacking when compared to the S or R movie. Badiyanu's persistent laughter is very irritating, moreso than what is usual for the Evil Villianess character-type. And she laughs so often you want to shoot yourself. The theme song &quot;Morning Moon&quot; is introduced and it is a light and fitting song, a great addition to the other movies' ending themes. There is virtually no Character Development. 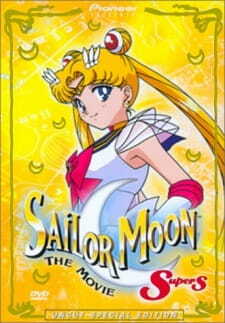 The story presents a conflict and the Sailor Senshi must resolve it. The end. The Enjoyment and Overall quality of this movie is average. Its delicious eye-candy but the plot fails to draw you in. This has to be my least favorite Sailor Moon movie out of the 3 that were dubbed. So much inaccurate things were going on that I just couldn't just let it brush past easily. Story: 7 Although the Story idea could have been creative and hilarous with it's villains. It's just a overally very poorly explained. I liked the fact that they kept the dream theme connection to the SuperS season, but it just makes the movie in general more confusing on a number of matters. Art: 10 The art was very colorful, and rich. You can tell the movie was mostly centered on Mini Moon or Chibi Moon in subs case, because you can tell the young kid theme behind the candy and fairy looking villains. Sound 6: I overally always love the music in Sailor Moon, but the music in this movie was just downright annoying, fruity and overall childish sounding. Asides from the transformation music, no major song was big in this movie. Character: Ok since obviously this movie is Mini centered it's supposed to feature mainly her of course with the Sailor Moon and Tuxedo Mask moments as well. For being a movie centered on Mini Moon however, I had enough with her character in this movie. While in the SuperS season she is pretty useful, she was just a powerless princess here. As for her sudden new "friendship" with the movie's new character. With her constant interest in someone else in SuperS, throwing someone else here, just made me gag. Top off his background was never explained good enough. Enjoyment: 8 Although this movie had me laughing at the villains, and other moments. It wasn't my best movie of Sailor Moon.